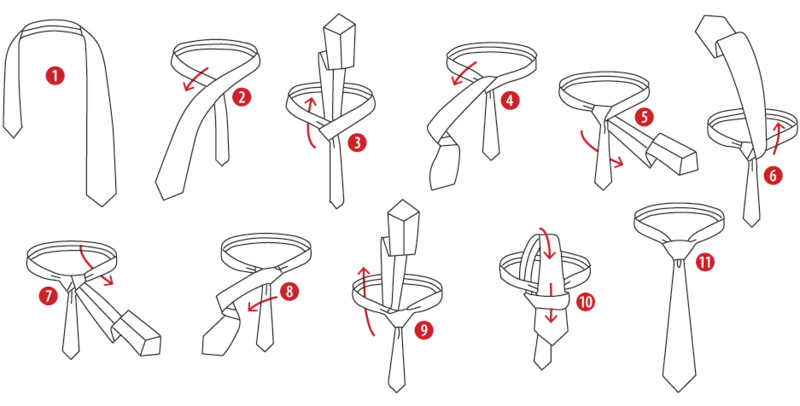 The Four-in-Hand is the most popular necktie knot. It’s easy to tie, tapered, and produces a slender shape. It works well with button-down dress shirts and wide, heavy-fabric ties. A good knot for everyday use. Position the wide end of the tie on the left and the small end on the right. Begin with the small end slightly above your belly-button (adjust according to your height). You will only move the wide end to tie the knot. Put the wide end over the small end to the right. Pass it under the small end and to the left. Go across the front and to the right. Go up into the neck loop from underneath. Put the end down through the loop you’ve just made in the front (pull the loop out a bit to make room). The Half Windsor is a versatile knot that creates a symmetrical triangular shape of medium size. It produces a noticeable dimple when tied properly. Good for ties of light to medium fabric. Go up to the center, towards the neck loop. Go down through the neck loop and to the right. Pass across the front, over to the left. Down through the loop you’ve just created in the front. The Windsor knot creates a large, wide triangular shape, and is best suited for spread or cutaway collars. Good for ties of light to medium fabric. Pass over the loop and down to the right. Go around the back of the small end to the left. Up to the center, towards the neck loop. Go down through the neck loop and down to the left. Pass across the front to the right. Back up into the neck loop from underneath.